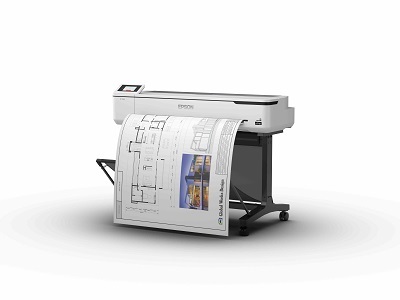 Epson Australia has launched two new high-speed, large format printers for architects, marking the global brand’s expansion of their T-Series product line to the low-to-mid-range CAD, AEC, GIS and POS markets. The two new wireless models, the 24-inch SureColor T3160 and the 36-inch SureColor T5160 are available as desktop or floorstanding models, are easy to set up, and combine a compact sleek design with fast and reliable printing performance. From printing blueprints and line drawings to signage and more up to 2,400 dpi, with precise detail and commercial-grade reliability, the highly versatile SureColor T3160 and SureColor T5160 printers will assist architecture professionals across a wider range of segments including engineering, CAD, GIS, education, corporate, home and small office. The printer is particularly ideal for small companies that have multipurpose print requirements in a limited workspace. Key features of Epson’s new large format wireless printers include unique auto-switching functionality enabling the printers to swap between large format roll paper and A4/A3 size paper, without users having to touch the printer; PrecisionCore MicroTFP printhead offering Precision Droplet Control for outstanding clarity; Nozzle Verification Technology to automatically detect and adjust nozzle condition; fast print speeds producing accurate A1 prints in 31 seconds for the SC-T5160 and 34 seconds for the SC-T3160; integrated wireless and Wi-Fi Direct connectivity allowing users to seamlessly print from tablets and smartphones; new 4.3-inch colour LCD touchscreen with simple and intuitive menu control and navigation; and next-generation high-capacity UltraChrome XD2 pigment inks delivering durable archival prints with brilliant colour and crisp lines on different paper types. The SureColor T3160 and SureColor T5160 printers feature a compact, clean design with an ultra-small footprint and sleek, minimalist design; high-capacity cartridges up to 50ml colour and 80ml black reducing need for frequent replacement; and versatile media handling accommodating rolls up to 24- and 36-inches and up to 50 sheets of A4 and A3 paper through the auto sheet feeder with autoswitch, as well as cut-sheet papers up to A1 (24”) or A0 (36”). Both printers come with a comprehensive 1-year on-site warranty and CoverPlus service packages are extendable up to 3 years. The SureColor T3160 and SureColor T5160 will be available in Australia from September 2018.